Reading at Montgomery County Community College – Marc Schuster, etc. 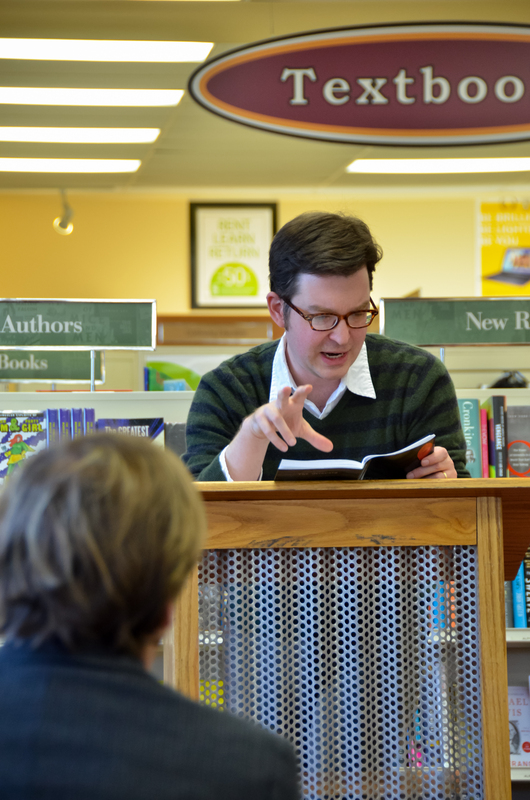 Big thanks to everyone who came out to my reading at Montgomery County Community College yesterday — especially Ryan Duschl for inviting me to speak at the bookstore and to MCCC alumnus Matt Carlin for photographing the event. Reading from a book of spells, I attempt to turn my friend Tom Powers into a unicorn. Marc—ever consider “propping out” with your signature RED BALLOON in the background of all your readings and photos? And if you don’t have real ones…Photoshop them in! It was great meeting you at Chester County Book & Music Company. Your knowledge and background in literature is far greater than mine. Maybe sometime before Christmas we could get together for a beer or few and talk writing. Thanks, Walt! Next time I’m heading out to West Chester, I’ll drop you a line! I definitely live on the wrong side of the ocean! I don’t suppose there’s a chance that you could blag your way onto a talk panel at the Discworld Convention in 2014 is there? At our first Convention we sat in on a panel because a good friend of ours was speaking about Victorian attitudes (and underwear!) and the speaker before her was talking about religion. I’d rather have seen you team up with Stacie any time! Sounds like fun! One of these days, I’ll have to make it over there!